Last week SK Rapid reached a compromise with the authorities of Vienna. Talks concerned partial and conditional legalization of pyrotechnics. 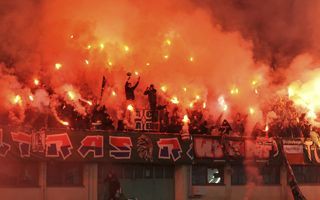 That’s a burning issue not only literally, but also financially with Rapid being the club with highest fines for “pyroshows”. From now on fans of the Green-Whites don’t have to hide their identity or try and smuggle flares inside the national stadium (their temporary home until new Weststadion is complete). They’re allowed to set stands on fire legally. Still, the new measure is a compromise and as such imposes several specific conditions on supporters. Firstly, they may use flares only in specific sections (lowermost rows primarily) and only with safe distance from other viewers. Furthermore, such shows should be submitted and approved before games. There are also limitation as to when flares are allowed to burn. Only at the beginning of each half, in the 75th and 90th minute. This makes four occasions for every home game and further ones depend on how many goals Rapid scores. With this season’s average of 2 per game this means 6 opportunities on average. How many flares can be used? Up to 20 per occasion, which means up to 120 per average game. That’s a lot from the perspective of countries where flares may result with even prison sentences. But in Wien fans aren’t that impressed. Rules applied from Sunday’s derby against Austria (with slightly different conditions) and yet not even one flare was lit. That was partly because of the weather as gameplay took place in early afternoon, full daylight. However, another reason you won’t see too many “hoorays” throughout Rapid’s social media is that similar exemptions were tried before. How it ended – with safety bodies finding sometimes very vague reasons or technicalities to introduce a ban again. Whether things would go different this time, we’re yet to see. First opportunity on May 24, when Rapid faces Wiener Neustadt in early evening.